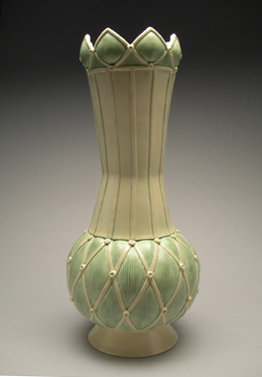 I’m delighted to be included in Schaller Gallery‘s online invitational exhibition Forms I. Thirteen makers from all over the country were each invited to send a teapot, jar, pitcher, and vase. (My grouping of four is pictured above.) 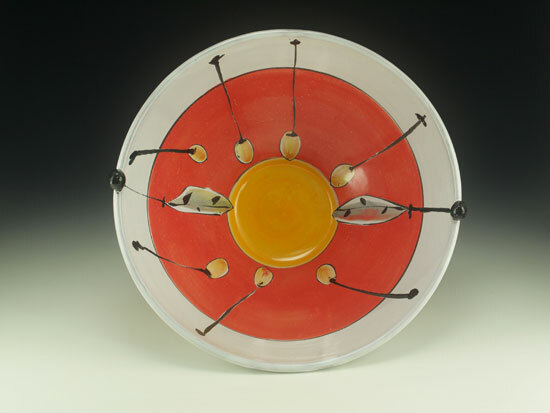 It’s always wonderful to see how different potters approach the same form, and this show highlights those delightful variations. The show is live with all work for sale, so click on over right here. Kristen Kieffer’s work, with its pattern-as-texture shares this kind of feeling–the surface and the form feel completely connected. Kieffer uses a stamping technique to apply the main textured pattern, and this changes the form as well as decorates it. The pattern functions to create differing surface depths in the which the glaze will pool and provide different levels of intensity of color, while simultaneously referring to both lace and metalwork. In the interior of the vase, one sees Kieffer’s fingerprints, and we are reminded that a real person’s hand made these marks in a specific time and place. These traces bring the vessel to life. I hope you can pick up a copy of the magazine and check out the whole article as it’s a very good read, especially given that the relationship between form and pattern is a major part of my deliberations as a maker. Thank you, Shana! Those of you who have seen the DVD and the “about” chapter know that this was a father-daughter project. This anniversary gives me another opportunity to give a big, huge thank you to my Dad. This project was his idea, and he was indeed the man behind the camera. The DVD could not have been done at all, let alone in such high quality, without his patience, superb directing eye, and tenacity in the editing process. Thank you, Dad! If you have yet to see the trailer for the video, have more questions, or would like to read comments by fans (like the wonderful ones by two very talented and well-respected ceramic artists below! ), please visit my DVD page right here to see what it’s all about! Thank you to everyone for your amazing support and comments this last year! Thank you to Ceramics Monthly for doing a synopsis (p. 62) for my Surface Decoration DVD in their November issue. And welcome to those of you who came to my website looking for more information after reading it! Everything you could possibly want to know about the DVD (including fan comments, techniques covered for pots to sculpture, a sneak peek trailer clip, and the link to buy!) is on my DVD page right HERE. Thank you for your interest and support for this independently made, produced and distributed instructional video.